34 mm 18K rose gold skeleton case set with 160 cut diamonds (approx. 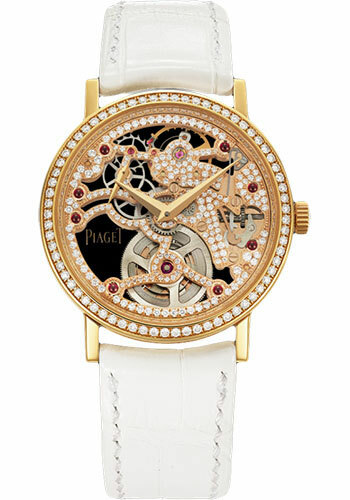 0.9 ct), 7.3 mm thick, sapphire skeleton back, diamond bezel, gem set dial, 838D manual movement, approximately 61 hours of power reserve, white alligator strap, ardillon buckle set with 23 cut diamonds. Water resistant to 03 ATM. 34 mm 18K white gold case set with 69 brilliant-cut diamonds (approx. 0.6 ct), 7.3 mm thick, gem-set skeleton sapphire back, gem set dial, 838D gem-set skeleton hand-wound mechanical movement with small seconds at 10 o'clock, hours, minutes, approximately 61 hours of power reserve, black alligator strap, ardillon buckle. Water resistant to 3 atm.